It is still the season for cruciferous vegetables such as cauliflower, cabbage, brussel sprouts bok choy, broccoli and similar green leaf vegetables. They are high in antioxidants and loaded with vitamins, minerals and fiber. This winter salad packs 2 in 1. Enjoy and feel good! Fry cauliflower bouquets in 1 tbsp of olive oil for about 10-15 min. Season. 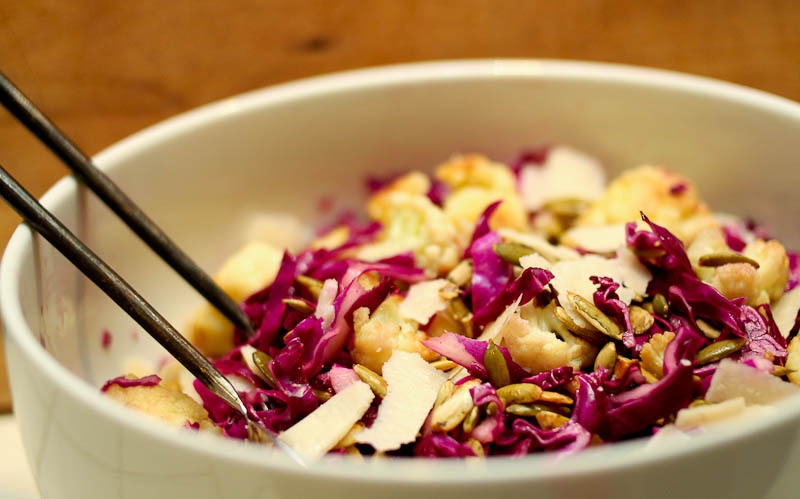 Slice the red cabbage and mix in a bowl with the remaining ingredients incl. cauliflower. Mix dressing together and pour over the salad. Shave parmesan using your veggie peeler. This salad is filling enough to eat as a vegetarian main dish served with bread. You can add extra nuts eg. walnuts or roasted almonds. This entry was posted in Dinners in 30 min or less, Salads & sides, Veggies only and tagged blomkål, cauliflower, cooking, Dinner in 30 min, healthy food blog, recipes, red cabbage, rødkål, salad, side dish, vegetarian, winter. Bookmark the permalink.